Shameless Self-Promotion: OUT NOW! FuseBox Radio & Never So Deep Records Present: Jim Snooka a.k.a. 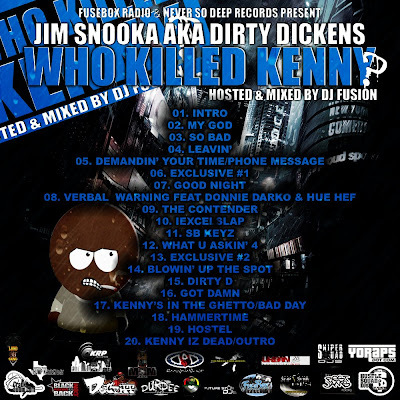 Dirty Dickens - Who Killed Kenny? Mixtape | BlackRadioIsBack.com - Official Blog of the Syndicated FuseBox Radio Broadcast! Here is the latest mixtape project mixed and hosted by your peoples DJ Fusion of BlackRadioIsBack.com and FuseBox Radio Broadcast. This project features dope independent South Carolina Hip-Hop MC, Jim Snooka, of Never So Deep Records. There's also going to be another version of this mixtape that's going to be done by Never So Deep Records label head DJ Bless, which we will be posting up soon.